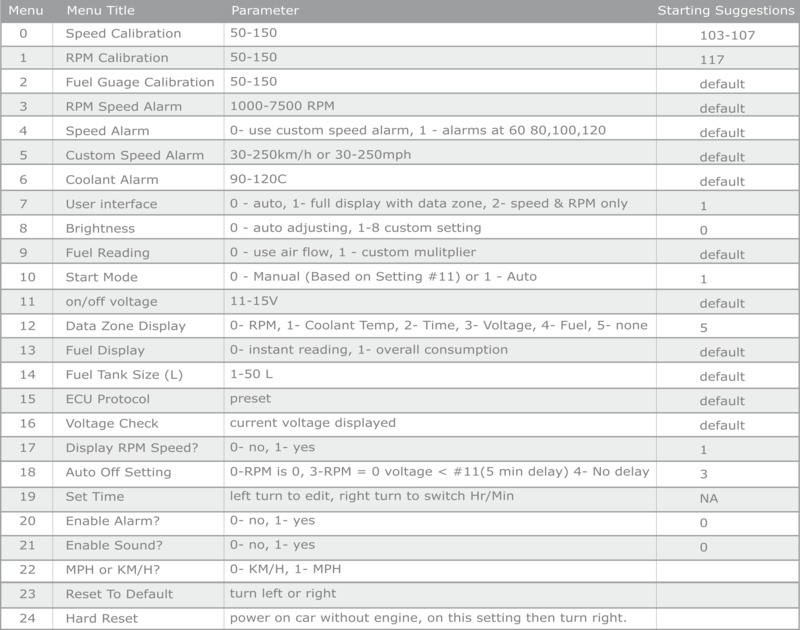 Some basic information to help get you started calibrating your F150's new personal HUD unit. When to use the reflective Film? Installing your HUD unit is a cinch, but dont worry, calibration is easy as well! To enter the calibration menu, simply press and hold inward on the control knob for 5 seconds. To cycle through different parameters, simply press inward momentarily on the control knob. When editing a parameter, rotating the control knob left or right will change the settings. Be sure to exit the calibration menu in order to save your changes. To exit the calibration menu, simply press and hold inward on the control knob for 5 seconds. Below are our basic starting settings. We suggest starting with these settings and adjusting from here. These settings will display speed and RPM alone, which is our preference. You can activate various other data displays and setting by changing the parameter field settings. For example; by changing parameter '12-Data Zone Display' from '5-none' to '2-time' your unit will now display the time data on your windshield along with speed/RPM. You can adjust the time display under parameter '19-Set Time'. Another Example; For speed calibration, the number of 50-150 is not your MPH or KPH. These numbers are simply a scale. If your HUD speed is low compared to your actual speed on your trucks dash, then you can raise this number. So if your HUD is reading 46 MPH but your truck says 47 MPH, raise this parameters settings a few points until it is calibrated to your liking. If your HUD display reads fast, then lower this scale as needed. Calibration Tip* - We suggest calibrating your HUD for speeds you normally drive at, such as 45 MPH etc instead of a low speed like 10 MPH.